Today we announced the launch of our new interactive background screening program builder that enables you to determine the types of background checks that are recommended for a particular role within your company. Simply answer a series of questions related to the risks and responsibilities of the job you’re seeking to fill and the program builder will present you with a summary of recommended background checks. 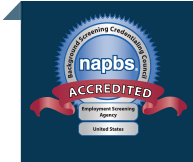 The background screening program builder is designed to help you easily determine the types of background checks that should be performed on your prospective (and existing) employees. You’ll obtain a simple checklist of background checks needed to help you make better hiring decisions, reduce your hiring risks, and demonstrate your required duty of “reasonable care” in the hiring process. Select the role for which the background checks will be used. For example, a hotel employer may wish to run background checks on their room service personnel. Answer a series of questions that will help us create a picture of the risks and requirements of the job. Factors such as industry type, level of supervision, and job prerequisites are considered. The program builder will display a list of recommended screening services, along with descriptions of each service. Finally, you can request a quote based on your results. When you consider that many employers fail to take the necessary precautions to protect themselves from the inevitable pitfalls of negligent hiring, this tool is an easy way to check your current efforts against what might be considered reasonable. Whether you find yourself trying to avoid ever facing a negligent hiring lawsuit or are simply suffering from the productivity, absenteeism, safety, and turnover issues that are inherent in a workforce that lacks appropriate screening, neglecting to check employee backgrounds or choosing the wrong types of background checks will set you up for negative consequences. Do it right! 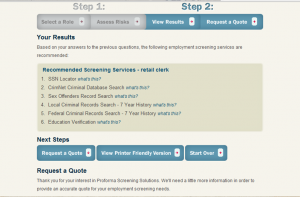 Start today with our interactive employment screening program builder.